Having a hard time recognising anyone! I have a Fortrose Academy class photo from 1951 or 52 which I have all the names for and tried to compare it with this one? Front row, sitting from left: maybe Ian Hay, Peter Rowett (Rosemarkie), ?, James Corbett, me, ?, looks like Stewart Mackay, ?, ?. Second row, kneeling from left: 3rd person could be John Goodall (spelling? ), 5th person could be William Jack. Is there anyone out there who can ID this group? Front Row: Ian Hay; Peter Rowatt; Douglas Owens; James Corbett; Kenny Macdonald; Hugh Donelly; Billy Hossack; Hamish Bisset; Jonathan Owens. Second Row: George Elder; Murdoch MacPhail; John Goodall; Sandy Brooks; William Jack; David Aynsley; Roddy Shaw; unknown; behind unknown Alastair Hossack; Hugh More; Douglas Miller; Robert Dobson. Back Row: William (Dada) Ure; Ritchie Wilkinson; Cameron Mackintosh; Robert Lees; possibly Bob Cherry; Miss Cameron (Cub Akela); Lord Rowallan; Mr Coutts (Scout Master); Pat Macrae; Colonel Ropner (District Commissioner); Rev. W. Craig (Group Scout Master); Alastair Geddes (Troop Leader). 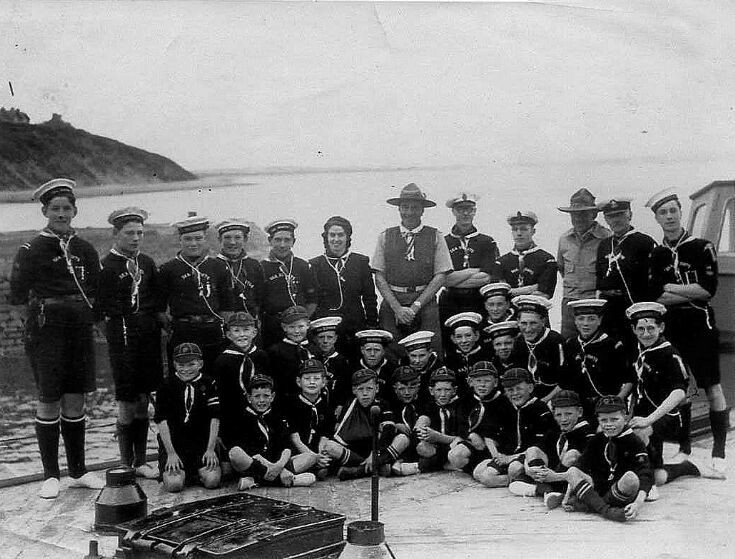 This was taken in summer 1950 and Jackson (William Jack) remembers that Lord Rowallan was rowed round from Avoch Harbour in the Scout boat. I joined the Scouts late that year and had one trip out in the boat before it was sold! Thanks Ian - brings back wonderful memories! Are you in contact with 'Jackson'? Just come across this interesting web-site! Having shared a room with William (Bill) Ure at Edinburgh University I lost contact with him until earlier this year - almost 60 years later! Great memories seeing this after 65 years and good to hear from my then next door neighbour Kenny Macdonald. I vividly remember having the hiccups when Lord Rowallan carried out his inspection, probably much to the amusement of others!